New Delhi, Feb 14: The surrender of Oggu Satwaji alias Sudhakar was a big shot in the arm for the security agencies. Pune, Nov 19: A letter dated September 25 2017 written by one naxalite to another speaks about the willingness of the Congress to help intensify nationwide protests. This letter was made public, when the Pune police submitted the same before a court as evidence. The letter was written by one Com Prakash to Com Surendra. New Delhi, Nov 7: A leadership change, followed by a plethora of surrenders. There was plenty of activity, where the naxalites were concerned. The police probing the killing of a TDP MLA and a former lawmaker at Araku has revealed that the top naxalite leader, Muppala Lakshman Rao alias Ganapathy has been replaced. The naxalites were raising funds from contractors in a bid to carry out an armed struggle, the National Investigation Agency said. In its chargesheet filed before a special court in Ranchi, the NIA said that the armed struggle was being carried out with an intent of overthrowing the Indian government. Two naxal leaders who have amassed wealth to the tune of Rs 1.5 crore will now come under the lens of the Enforcement Directorate. The Bihar government urged the ED to probe and confiscate the wealth amassed by two naxal leaders. Stepping up the heat against the Maoists, security forces will now conduct anti-naxal operations based on real time information. The information will be provided in real-time by Unmanned Aerial Vehicles (UAV) so that the “traps” planted by the extremists could be avoided. New Delhi, Nov 29: 564 naxalites and their sympathisers have surrendered in the past one month. This is in fact a huge number and 70 per cent of the surrenders have been reported from Malkangiri district in Odisha. Statistics would also show that since November 8, 469 naxalites have surrendered. There is a need to stress on November 8 since this was the day the Prime Minister announced that the Rs 500 and 1,000 notes will cease to be legal tender. 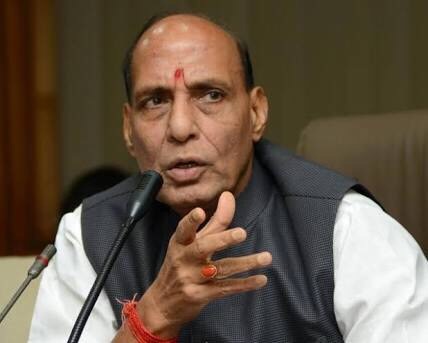 Hyderabad, Nov 25 The naxalites are devastated and the terrorists have no funding, Union Home Minister Rajnath Singh said on Friday. Singh was speaking at the DGP’s conference at Hyderabad. Hyderabad, Aug 15: The case relating to former naxal turned gangster, Nayeemuddin was a strange one. The probe that is being conducted following his death in a police encounter has revealed shocking details. One such detail probes his weird side and police officials say that they have recovered several photographs suggesting that he was a cross dresser.